This is a guide to making a beer with the minimum amount of gear possible. A lot of this kit you’ll be able to find in your kitchen – but even if not, you should be able to get started for under £30. I’ll update it in time with a video, some pictures or even a fancy infographic but this’ll do for the time being. This method is heavily inspired by the BIAB (Brew in a Bag) brewing method. The main difference between this and the traditional homebrew method is that you don’t have a separate vessel for mashing and boiling and you can use the full quantity of water for the final wort in the mash. I tend to sparge (pour a kettle or two’s worth of warm water over the grains once they’re out of the wort) to extract a decent amount of sugar from the grains but it’s not essential. One of the things that can overwhelm (it certainly did me) and even put off the homebrewer at the start is the sheer number of ingredients available. After a while you do get used to it but it’s a bit of a hump. I’ll try and explain what you need right at the start at least. Most beers have a base malt (for fermentable sugars) like pale or pilsener malt and a speciality malt (for flavour and colour and not so many fermentables). To start out find a recipe with either pale malt only or pale + crystal. I’ve chucked in a bit of torrified wheat to the recipe as this helps with head retention (keeping your head for as long as possible!). Again, get what you need once you’ve decided on a recipe. Store in sealed bags in the freezer once you’ve used them. For your first beer try just using a single type of hop – I’ve used American hop type Cascade for this one. Get some Safeale S-04 or S-05. They’re proper workhorses and you shouldn’t have any issues with stuck fermentations or the like. You’ll learn that different yeast give off different flavours in due course but for the time being, don’t worry. Make sure the temperature where they’re fermenting is a stable and 18-20C. Higher or lower and you may have some issues. Most people don’t tend to worry about water in the beginning. I’d tend to agree but I would also say that it should be high on the list of your priorities to get organised – it’ll have a massive effect on your beer quality. Head on over to our Brighton water page if you’re in the area and you should have a decent enough idea about what to do with your water treatment. Head to Murphy and Son and get a water test done if you want your water properly treated. All of these you can get online somewhere like the maltmiller or brewuk. I can supply some as I have a few spares. Turn the oven on to 65-70C. Add 9 litres of water to the pot (you may need to make a dipstick or to etch markings in the side of the pot to get an accurate measure of the volume in the pot) and heat up to about 70C. Place in oven for 1 hour – the oven should hold the temp of the mash due to the external heat being the same as that of the pot. There are other ways to do this – you can insulate your pot to hold temperature, you can keep it on the hob and check every 15 minutes and adjust accordingly. Whatever works with your kit. Pull bag out, waiting for liquid to drain. Do not squeeze as this adds undesirable flavours to the beer. Measure water – the grains absorb water so you’ll need to adjust the levels here. During the boil, 10-20% of the water will evaporate so you may want to get the pre-boil volume to 9-10 litres as the final volume is 8 litres. 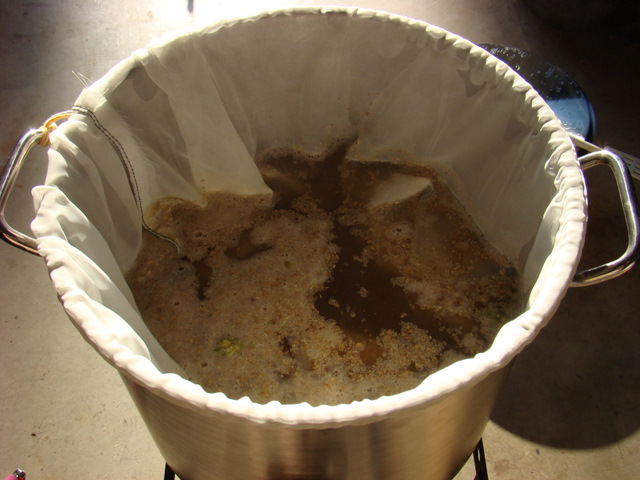 You might want to “sparge” at this point – by running some water over the removed grain bag and placing that back into the wort. I use a colander (to sit the grain bag on) and a steamer (to allow for even distribution of the water over the grain bag) in the fermentation vessel. Just make sure you collect the water and add it to the wort before the boil begins. The hops are added at different intervals depending on whether they’re bittering or aroma hops – bittering at the beginning and aroma towards the end. In most recipes the boil is 60 minutes and hop additions are indicated as time before the end of the boil – ie “60 minutes” at the beginning and “15 minutes” is in the 45th minute of the boil. Do make sure you have an accurate way of measuring the hops as small amounts can be important at this quantity. I’ve got a scale that measures down to 0.1grams – they’re less than £10. Recipes measure hop additions from the start of the boil. So if it says “60 minutes”, then it means it’s 60 minutes before the end of the boil, if it says “15 minutes” it’s 15 minutes before the end. Add first (60 minute) hops. I put mine in the (cleaned) nylon bag I used for the grains as it gives freedom for them to swill around but means I don’t have to filter afterwards. If you’re not using a filter you may want to just use a sanitised sieve when you’re pouring the wort into the fermentation vessel to strain the hops out. Add any more additions into the boil as it goes along. You need to cool down the wort (the liquid) as fast as possible now. I just chucked it in a sink full of cold water and changed it once. Took about 30 minutes.You can add ice to speed this up. You can get or make an immersion chiller, counterflow chiller or better still, a plate chiller if you’re working with larger volumes of wort. It needs to get down to at least 20C for it to be right. Any higher and you might risk damaging the yeast. It’s important to know that at this stage, you need to pay special attention to hygiene. After the boil, you want the least amount other bugs to come in contact with the wort – so clean and sanitise everything that the wort comes in contact with. If you compare that with the “Final Gravity”, you can work out the ABV (Alcohol by Volume) ie % alcohol. You can work out the efficiency of your brewhouse. This means that when you’re designing recipes in the future you can take into account this figure. If you get a 4% beer instead of your planned 6% beer due to a lower efficiency – the massive amount of hops you chuck in will overwhelm the beer and taste extremely bitter. During fermentation, if it stops (ie bubbles in airlock stop) or you’re not sure if it finishes, a quick measure of the gravity will tell you how much the yeast has fermented of the wort. If it’s at the level to be expected, then go ahead and bottle. If it’s less than expected, then you’ll need to do something about it. Certainly, don’t bottle. Clean the demijohn and bung with cleaning solution. You can buy special brewery cleaning stuff like StarSan. If you’re on a budget, use 1 capful for a half demijohn full of thin chlorine bleach solution and rinse thoroughly. Other options are baking it in the oven or using some antiseptic tea. Use a sanitised funnel or jug to pour in the wort, making sure that if you’re using a demijohn, you allow about 2 inches clearance from the neck to allow for the yeast cake which will rise above the surface of the wort. Bung a clean finger over the lid and give it a good shake to oxygenate the wort. Yeast loves oxygen before fermentation begins. Later on, you’ll do everything you can to prevent the fermented beer from being oxidised. I use a santised hand blender with a whisk attachment and it does a lovely job. Wait. Fermentation should start within 24 hours. If it doesn’t, you might need to pitch in a different pack of yeast. 2-5 days should be enough for the beer to finish fermentation. It depends on external temperatures, yeast type, wort strength. Give it about 2-4 weeks before bottling. This is called conditioning. After a month or so of conditioning, syphon the beer into bottles, making sure you don’t add or stir up any of the sediment at the bottom. You’ll need to prime the beer with sugar. You can either syphon the beer into another vessel and “batch prime” ie add sugar syrup to the whole lot and stir well, or you can prime it bottle by bottle if you have some accurate scales. The batch priming method is easier but there’s a risk of oxidation and contamination with this. There are online carbonation calculators for this. Wait for about a week or so for the remaining yeast to ferment the added sugars – the CO2 released will carbonate the beer as the bottle is under pressure. I’m guessing no one needs instructions for this part… Just send me an invitation!